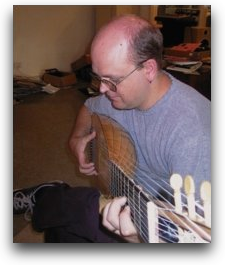 Simon Martyn-Ellis began playing the lute after finding the classical guitar repertoire too restrictive for ensemble performance: continuo accompaniment remains a mainstay of his activities. Simon completed an Honours degree at the University of New England in performance on the lute and related instruments in 1994, studying with Tommie Andersson. He has undertaken summer courses and private lessons with Hopkinson Smith, Jakob Lindberg and William Carter, and completed post-graduate study with Rolf Lislevand at the Trossingen Hochschule für Musik, Germany. Since moving to Germany in late 2002, Simon has appeared with the Freiburger Barockorchester, and with the La Cetra Basel, Balthasar-Neumann Ensemble, Main Barockorchester, Erato Ensemble, Bayerischer Kammerphilharmonie, the Accademia de Santa Cecelia Orchestra in Rome, as well as in a variety of chamber music performances. In Australia, he appeared in the Melbourne and Adelaide International Festivals with Collegium Vocale Gent and Ensemble 415, respectively. Simon has also appeared with leading Australian groups, including Opera Australia and the Adelaide and Melbourne symphony orchestras, and chamber ensembles such as the Elysium Ensemble and Salut! Baroque, with both of which he has recorded CDs.